Dragon Ball Super: Broly (Japanese: ドラゴンボール超（スーパー） ブロリー, Hepburn: Doragon Bōru Sūpā: Burorī) is a 2018 Japanese anime martial arts action film, directed by Tatsuya Nagamine and written by Dragon Ball series creator Akira Toriyama. It is the twentieth Dragon Ball feature film overall, the third film produced with Toriyama's direct involvement, and the first to carry the Dragon Ball Super branding. Set after the events of the Universe Survival Saga depicted in Dragon Ball Super, the film follows series protagonists Goku and Vegeta as they encounter a powerful Saiyan named Broly. In the beginning, it tells the history of the Saiyans and the background story of these three Saiyans with different destinies connected to the turbulent period of their race, and later resulting in a massive fight between them. Dragon Ball Super: Broly (Japanese: ドラゴンボール超（スーパー） ブロリー, Hepburn: Doragon Bōru Sūpā: Burorī) is a 2018 Japanese anime martial arts action film, directed by Tatsuya Nagamine and written by Dragon Ball series creator Akira Toriyama. It is the twentieth Dragon Ball feature film overall, the third film produced with Toriyama's direct involvement, and the first to carry the Dragon Ball Super branding. Set after the events of the Universe Survival Saga depicted in Dragon Ball Super, the film follows series protagonists Goku and Vegeta as they encounter a powerful Saiyan named Broly. In the beginning, it tells the history of the Saiyans and the background story of these three Saiyans with different destinies connected to the turbulent period of their race, and later resulting in a massive fight between them. The film represents the first canonical appearance of Broly in the primary Dragon Ball series continuity, following the character's appearances in the non-canon films Broly – The Legendary Super Saiyan (1993), Broly – Second Coming (1994), and Bio-Broly (1994). Dragon Ball Super: Broly is the highest-grossing Dragon Ball film ever, and one of the highest-grossing anime films of all time. Forty-one years ago, the Saiyan homeworld Planet Vegeta is ruled by King Cold's forces, who delegates command of the forces to his son Frieza. King Vegeta, leader of the Saiyans, believes his son Prince Vegeta is a prodigy destined to liberate their people and rule the universe. He learns of Broly, a Saiyan baby born with an abnormal power level that exceeds that of his son, and exiles Broly to the distant planet Vampa. Broly's father Paragus goes after his son, but they are stranded on Vampa after their ships are damaged. Paragus vows to raise Broly as a mighty warrior to exact revenge on King Vegeta. Five years later, a low-class Saiyan warrior named Bardock becomes suspicious of Frieza and sends his son Kakarot (later named Goku) to Earth. His suspicions are confirmed when Frieza, upon learning of a legend about a Legendary Super Saiyan who could one day defeat him, destroys Planet Vegeta. The Saiyan race is eradicated, save Broly and Paragus, Goku and his brother Raditz, Vegeta and his comrade Nappa, and Vegeta's brother Tarble. In the present day, Goku and Vegeta train on an island with Bulma, Bulla, Beerus, and Whis. Bulma is contacted by Trunks, who informs her that six of the Dragon Balls have been stolen by Frieza's soldiers. Goku, Vegeta, Bulma, and Whis travel to the Arctic to find the seventh Dragon Ball before Frieza can retrieve it. Meanwhile, Broly and Paragus are rescued from Vampa by Cheelai and Lemo, two low-class soldiers in Frieza's army searching for recruits. They are brought to Frieza, who recruits them to help him defeat Goku and Vegeta. The two groups come face-to-face in the Arctic, where Paragus orders Broly to attack Vegeta. Broly fights Vegeta and then Goku, growing stronger as the fight goes on and catching up to their Super Saiyan God forms. Goku overpowers Broly with Super Saiyan Blue and Frieza responds by murdering Paragus, triggering the awakening of Broly's Super Saiyan powers. He overwhelms Goku and Vegeta with his new power, so they trick him into attacking Frieza instead and then teleport to Piccolo's location. Goku and Piccolo teach Vegeta how to use the Fusion Dance technique; about an hour later, after two failed attempts, Goku and Vegeta successfully fuse together into Gogeta and teleport back to the battlefield. Gogeta turns Super Saiyan and engages in a beam clash with Broly, which shatters the fabric of reality and sends the two into another dimension. Gogeta dominates the fight until an infuriated Broly powers up even further into his Legendary Super Saiyan form. This allows Broly to regain the advantage, until Gogeta powers up into Super Saiyan Blue, allowing him to dominate the fight once again. The two then clash even more violently, breaking through multiple dimensions, before arriving back in the real world. Gogeta defeats Broly and is about to obliterate him with a powerful energy wave, but Cheelai and Lemo, who had formed a friendship with Broly, summon Shenron with the Dragon Balls and use their wish to transport Broly back to Vampa. Frieza retreats, promising to return another time. Goku later meets with Broly, Cheelai, and Lemo on Vampa, wishing to be friends and providing them with various survival supplies from Capsule Corp, while also hoping to spar with Broly again. Gen Fukunaga, Christopher Sabat and Sean Schemmel speaking on the Dragon Ball Super panel at San Diego Comic-Con International. The film is produced by Toei Animation. It was originally announced under the tentative title of Dragon Ball Super - The Movie on December 17, 2017, during Jump Festa with the general theme being "The Strongest Warrior Race in the Universe, The Saiyans". A poster was released on March 13, 2018, 11 days before the airing of the final episode of Dragon Ball Super, featuring an entirely new traditional animation design by Toei animator Naohiro Shintani, as opposed to veteran Dragon Ball character designer Tadayoshi Yamamuro. One week later, the first trailer for the film was released publicly through Toei Animation featuring the all–new character designs and an enigmatic new villain. Akira Toriyama wrote the story, screenplay and designed the characters, Tatsuya Nagamine is film director, Naohiro Shintani is animation director, Kazuo Ogura is serving as art director, Rumiko Nagai as color designer, Naotake Oota is in charge of special effects, and Kai Makino is the CG director. The film includes elements of the 2014 "Dragon Ball −(Minus): The Departure of the Fated Child" story written by Toriyama as canon. On July 9, 2018, the movie's title was revealed to be Dragon Ball Super: Broly, revealing the unknown villain to be the titular character Broly who first appeared in the 1993 film Dragon Ball Z: Broly – The Legendary Super Saiyan. Toriyama stated the character and his origin is reworked, but with his classic image in mind. With this movie portrayal, the character would become part of the series official canon. Other new characters introduced in the film are Goku's mother Gine, Kikono, Berryblue, Cheelai, and Lemo serving in the Frieza's army, and Saiyan Beets. The official music video of the main theme song played by singer Daichi Miura. The film score was composed by Norihito Sumitomo. The original soundtrack, containing 35 tracks, was released on 12 December, by Avex Trax. In August 2018, was reported a rumor that the Dragon Ball Z iconic theme song "Cha-La Head-Cha-La" would be also featured in a new arrangement. In October 2018, it was announced that Daichi Miura would perform the film's theme song "Blizzard", which was released as a single on 19 December, by Sonic Groove. Three versions of the single "Blizzard" were released (CD+DVD Edition, Single CD Edition and CD "Dragon Ball Super: Broly" Cover Edition). In its first week of release the CD single sold 22,826 copies. In his sixth week in the Charts, "Blizzard" reached number 2 on the Billboard Japan Hot 100 and achieved the number 1 on the Billboard Hot Animation. Billboard in San Diego advertising the North American release. As a promotion, pre-order ticket holders in Japan, limited to fifty thousand, starting on July 20 would receive one of two charms of the characters Goku and Vegeta, whose hair changes based on the temperature of the figure. A promotional one-hour television special aired on Fuji TV in Japan on December 2, 2018, entitled "Just before the Dragon Ball Super debut! TV version climax recap". The film was promoted through the "Dragon Ball North America Tour 2018 with Bandai Collectibles" sponsored by North American anime distributor Funimation, which was held in seven cities in the United States and Canada, starting with a San Diego Comic-Con International panel on July 19, and ending at Dallas Fan Days on October 21, 2018. 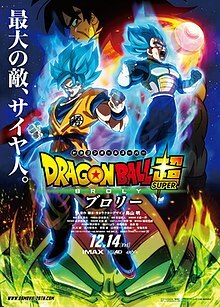 Due to the upcoming release of the film, in September and November was held a limited theatrical release and debut of the original film Broly - The Legendary Super Saiyan (1993), and TV special & film Bardock - The Father of Goku (1990) and Fusion Reborn (1995) jointly titled as Dragon Ball Z: Saiyan Double Feature, by Fathom Events and Toei Animation in the United States, with the audience receiving an exclusive limited edition content. To promote the North American release of the film, a Goku balloon debuted on the 92nd Macy's Thanksgiving Day Parade in 2018. On December 14, 2018, was released an official same-titled novel written by Masatoshi Kusakabe, which among other reveals that Vegeta is actually Vegeta IV or the Fourth, King Vegeta is Vegeta III or the Third, as well the name of two Saiyans, Leek and Taro, who were shown together with Bardock. It was one of the twenty top-selling light novels of January 2019, selling 10,466 copies in Japan. The film is distributed in Japan by Toei Company in cooperation with 20th Century Fox, while its international distribution rights are owned by 20th Century Fox. Funimation bought the rights for theatre screen in the United States and Canada, as well other release and broadcast rights. In addition to regular screenings, it is also screened in IMAX, MX4D, and 4DX. The film is the first anime to be screened in IMAX in the United States, with a limited projection beginning January 16, 2019. On July 19, 2018, trailers for both the subtitled and dubbed versions were released online after being shown at San Diego Comic-Con. On October 5, 2018, the second official trailer for both the subtitled and dubbed versions were released online after being shown at New York Comic Con during the Dragon Ball Super: Broly panel at the Hulu Theater at Madison Square Garden. The third trailer was released on November 7, 2018, but only subtitled, while dubbed version on 20 December. The fourth which was a music trailer featuring the theme song "Blizzard" was released on November 24, 2018. The fifth and final trailer was released on 29 November 2018, with a dubbed version, also of the theme song, on 4 December 2018. Each trailer covered a different aspect of the film; the first introduced Broly and his fights against Vegeta, Goku and Frieza, the second their origin stories, the third more scenes from the fights, the fourth recapped previous scenes, and fifth which was the shortest introduced Gogeta's battle against Broly. The world premiere of Dragon Ball Super: Broly was held at the Nippon Budokan in Tokyo on November 14, 2018. This event was limited to only 1,000 guests that were selected via lottery through Weekly Shōnen Jump No.47 and the December V Jump. Broly was open nationwide in Japan on December 14, 2018, while Funimation's English dub had its world premiere at TCL Chinese Theatre in Los Angeles on December 13 followed by its United States and Canada release a month later on January 16, 2019 by Funimation Films. In the United Kingdom and Ireland, Manga Entertainment screened the film theatrically from January 23, 2019. In Australia and New Zealand, Madman Entertainment screened the film theatrically from January 24, 2019, and also screened the IMAX and 4DX versions of the film in select cinemas. In its opening weekend between 14-16 December 2018, the film was shown on 467 screens in Japan, and surpassed Dragon Ball Z: Resurrection 'F' to set a new opening weekend record for the franchise. It opened at number-one at Japanese box office by dominating the weekend from December 14 to 16, selling more than 820,000 tickets and earning more than ¥1.05 billion ($9.26 million) in its first three days. In its first six days it sold more than 1 million tickets and earned ¥1.3 billion ($11.6 million). The Mainichi Shimbun newspaper reported that the film has earned more than ¥2 billion (US$18.1 million) after 11 days at the box office, being the fastest film in the franchise to hit that mark. It has also sold more than 1.5 million tickets. After three weekends, on 31 December it earned $23.6 million in Japan, and roughly $24.4 million internationally. According to Crunchyroll, after 24 days the film earned ¥3.35 billion on 2,604,870 tickets in Japan. After 32 days of release (14 December 2018 to 14 January 2019), the film had earned ¥3.64 billion ($33.54 million), with 2,823,215 tickets having been sold. After 38 days of release, the film's earnings had increased to ¥3.75 billion ($34.23 million) to become the highest grossing film in the series. On seventh weekend, the film dropped from sixth to ninth place. As of 3 February 2019, the film has sold 3,009,730 tickets and grossed ¥3,895,569,200 ($35.43 million) in Japan. After four weekends, on 6 January 2019, it was estimated to have earned $32.3 million worldwide, with $29.7 million coming from Japan and $3.3 million from five other countries, including the highest-grossing opening by a Japanese film in Brazil with $1.7 million, and by a Japanese animation film in Malaysia with $232,000. During its release on 10 January in Latin America, in Peru the film had the second best premiere in history reaching 257,420 spectators on its first day of release, only surpassed by the Avengers: Infinity War with 291,629 in 2018, as well best premiere for an animation film in Bolivia. In Argentina, Bolivia, Paraguay, Puerto Rico and Uruguay the film also debuted at number-one at the box office. In its first Latin America weekend it grossed reportedly over $6.1 million in Mexico alone, while according to Deadline Hollywood, "Peru ($2.5 million) and Argentina ($1.55 million) gave Fox its biggest opening weekend ever, followed by Chile ($1.7 million) with the industry's 3rd biggest animation opening of all time. In Colombia it was Fox's 4th biggest opening weekend ever at $1.5 million and in Ecuador, the Toei anime fantasy is Fox's top launch ever, and the 3rd best superhero bow, behind Avengers: Infinity War and Thor: Ragnarok" with $1.3 million. In its fifth weekend ending 13 January 2019, the film grossed $19.2 million from 17 territories, becoming the weekend's third top-grossing film in international markets, behind only Bumblebee and Aquaman, which brought the film's worldwide gross to $53.5 million ahead of its United States release. On the weekend ending 20 January, the international cume had increased to $65.9 million, holding onto the number 1 spot in Chile ($3 million), Peru ($3.8 million) and Ecuador. The film's gross increased to $9.5 million in Mexico, $4.3 million in Brazil, $2.6 million in Argentina and $2.4 million in Colombia. Alongside its domestic total, the worldwide gross increased to $88.7 million. In the United States the film earned $7.03 million on its opening day, which was a new series record, besting Resurrection 'F''s $1.97 million. It again topped the United States box office on its second day of release with $3.3 million, for a two-day total of $10.4 million. It earned $2.39 million on Friday (18 January), earning $12.8 million total in its first three days. The film ended up grossing $9.8 million across the three-day opening weekend (and $11.94 million across the four-day MLK Weekend) to bring its domestic total up to $22.6 million in six days, far surpassing the original estimates of $11 million. In its second weekend it fell 63% to $3.6 million, finishing 10th. It became the 3rd highest grossing anime film in the United States of all time. In the United Kingdom and Ireland, it became the third highest-grossing anime film ever, earning £850,000 ($1.09 million) on its first weekend. It debuted at number 7 in Australia and number 1 in New Zealand, raising $1,322,182 and $309,209 respectively. In the Netherlands, it raised €377,570 ($425,671) in its first week of release, entering at number 4. About 73,000 people saw the movie on its premier on 29 January in Germany. As of 19 February 2019[update], Dragon Ball Super: Broly has grossed over $30.7 million in the United States and Canada, and $72.6 million internationally from Fox distributed markets, for a worldwide total of over $103.3 million. It is the 12th highest grossing anime film internationally of all time. On review aggregator Rotten Tomatoes, the film holds an approval rating of 82% based on 49 reviews, with an average rating of 7/10. The website's critical consensus reads, "Dragon Ball Super: Broly may seem like colorful chaos to newcomers, but for longtime fans, it represents this long-running franchise near its action-packed apogee." On Metacritic, which assigns a normalized rating to reviews, the film has a weighted average score of 59 out of 100, based on 6 critics, indicating "mixed or average reviews". According to Pia's first-day satisfaction survey of Japanese audiences, it ranked as No 1. with an audience approval rating of 92.7%, while American audiences gave the film five out of five stars on PostTrak, including a 91% positive score and 78% "definite recommend." It received critical acclaim from the initial critical reviews by Anime News Network, IGN, and Comic Book praising the story, animation style, humour, as well Broly for making the movie a "meaningful character piece about a broken man haunted by his abuse-filled past—twisted into something he was never destined to become". In a 5 out of 5 stars review by Stuff, it was considered as the "best Dragon Ball film" with the only prominent critical point that "there are certain scenes where it transitions between 2D animation and 3D ... which can disrupt the flow of it all". Ollie Barder writing for Forbes, stated that the "only real criticism at this point is that after this solid narrative starting setup, we have a pretty hefty time jump to where we are post-Dragon Ball Super. Considering the depth and breadth of the story between these points of time, it would have been nice to have a bit more exposition to help with the pacing. However, that said, this is already a long movie and we all know that we have a massive fight to look forward to". Allegra Frank of Polygon concluded that the movie "gets the fundamentals of Dragon Ball extremely right, no matter where you're coming in from", with "no grand statements to be made in Dragon Ball Super: Broly, and more amusement than anxiety". The film was nominated for the Animation of the Year at 42nd Japan Academy Prize. 1 2 3 4 5 6 Pineda, Rafael. "Dragon Ball Super Film Reveals Dragon Ball Super: Broly Title, Visual". Anime News Network. Archived from the original on 2018-07-10. Retrieved 9 July 2018. ↑ "DRAGON BALL SUPER BROLY". British Board of Film Classification. 18 December 2018. Retrieved 3 January 2019. ↑ "Dragon Ball Super: Broly - Película de animación logra recaudar $54 millones a nivel mundial" (in Spanish). RPP. 16 January 2019. Retrieved 17 January 2019. 1 2 3 "Dragon Ball Super: Broly (2019)". Box Office Mojo. Retrieved 20 February 2019. ↑ "Dragon Ball Super: Broly (2019)". The Numbers. Retrieved 21 February 2019. 1 2 3 Richard Eisenbeis (17 December 2018). "Dragon Ball Super: Broly Review". Anime News Network. Archived from the original on 2018-12-17. Retrieved 18 December 2018. 1 2 3 Hata, Fuminobu. "Dragon Ball Super: Broly Review". IGN. Archived from the original on 2018-12-18. Retrieved 18 December 2018. ↑ Nick Valdez (24 July 2018). "'Dragon Ball Super: Broly' Releases Full Story Summary". ComicBook. Archived from the original on 2019-01-05. Retrieved 21 October 2018. ↑ "About The Movie: DragonBall Super Official". www.dragonballsuperofficial.com. Retrieved 2018-10-21. ↑ Funimation (2018-12-04). "Dragon Ball Super: Broly - ENGLISH CAST ANNOUNCEMENT". @FUNimation. Retrieved 2018-12-04. ↑ "'Dragon Ball Super: Broly' Reveals Gogeta English Dub Trailer". comicbook.com. December 1, 2018. Archived from the original on 2018-12-03. Retrieved 2018-12-06. ↑ "English voice cast talks Dragon Ball Super: Broly film and anime's popularity (Video)". fansided.com. December 11, 2018. Archived from the original on 2018-12-12. Retrieved 2018-12-18. ↑ "Akira Toriyama Announces New 'Dragon Ball' Movie For December 2018". Okay Player. Retrieved 9 July 2018. ↑ Reynoso, Michael. "'Dragon Ball' 2018 Movie Preview: "A Super Movie Begins!"". Geeks Media. Retrieved 9 July 2018. ↑ Hay, Seth. "Dragon Ball 20th Movie Gets A Poster & Date". Cat With Monocle. Retrieved 9 July 2018. ↑ "Dragon Ball Super: Broly Evolves its Animation for a New Generation". Crunchyroll. 26 July 2018. Retrieved 10 November 2018. ↑ Peters, Megan (20 March 2018). "'Dragon Ball Super' Movie Reveals First Teaser Trailer". ComicBook. Archived from the original on 2018-07-04. Retrieved 9 July 2018. 1 2 3 Karen Ressler (7 November 2018). "Dragon Ball Super: Broly Film's Final Trailer Streamed". Anime News Network. Retrieved 9 November 2018. ↑ "Dragon Ball Super: Broly Trailer #2 Breakdown - DB Minus is Canon!". IGN. 5 October 2018. Archived from the original on 2018-10-07. Retrieved 9 November 2018. ↑ Shawn Saris (24 July 2018). "Dragon Ball Super: Broly Movie Trailer Hints at a Major Change in Broly's Backstory". IGN. Archived from the original on 2018-11-09. Retrieved 9 November 2018. ↑ Brian Barnett (31 October 2018). "The History of Broly". IGN. Archived from the original on 2018-11-10. Retrieved 9 November 2018. ↑ Ryan Gilliam (10 July 2018). "Dragon Ball's next movie reintroduces the infamous Broly". Polygon. Archived from the original on 2018-07-28. Retrieved 9 November 2018. ↑ Megan, Peters (9 July 2018). "'Dragon Ball' Creator Confirms Broly Will Become Canon In 'Dragon Ball Super: Broly'". ComicBook. Archived from the original on 2018-07-13. Retrieved 9 November 2018. ↑ Outlaw, Kofi (27 August 2018). "'Dragon Ball Super' Confirms Its 'Dragon Ball Minus' Connection". ComicBook. Archived from the original on 2018-10-08. Retrieved 9 November 2018. ↑ Outlaw, Kofi (13 September 2018). "'Dragon Ball Super: Broly' Cast Reveal Details About Movie's New Characters". ComicBook. Archived from the original on 2018-09-14. Retrieved 9 November 2018. ↑ Outlaw, Kofi (18 October 2018). "'Dragon Ball Super: Broly' Reveals Identity of Trailer's Mystery Saiyan". ComicBook. Archived from the original on 2018-11-03. Retrieved 9 November 2018. ↑ Kofi Outlaw (22 October 2018). "'Dragon Ball Super: Broly' Composer Teases Movie's Reboot Goals". ComicBook. Archived from the original on 2018-11-06. Retrieved 9 November 2018. ↑ ""Dragon Ball Super: Broly (Movie)" Original Soundtrack". CDJapan. Retrieved 9 November 2018. ↑ Michael Hein (22 August 2018). "'Dragon Ball Super: Broly' Will Bring Back A Classic Theme Song". ComicBook. Archived from the original on 2018-10-04. Retrieved 9 November 2018. 1 2 Kofi Outlaw (25 October 2018). "'Dragon Ball Super: Broly' Announces Official Theme Song". ComicBook. Archived from the original on 2018-11-07. Retrieved 9 November 2018. ↑ Rafael Antonio Pineda (24 October 2018). "Daichi Miura Performs Dragon Ball Super: Broly Film's Theme Song". Anime News Network. Archived from the original on 2018-11-09. Retrieved 9 November 2018. ↑ "Dragon Ball Super: el tema principal de Broly por Daichi Miura se presenta en un nuevo tráiler" (in Spanish). Moshi Moshi Nippon. 9 November 2018. Retrieved 23 January 2019. ↑ "Japan's Weekly CD Rankings for Dec 17 - 23". MyAnimeList. 28 December 2018. ↑ "Japan Hot 100" (in Spanish). Billboard. 29 December 2018. Retrieved 23 January 2019. ↑ "Billboard Hot Animation (17 al 23 de diciembre 2018)" (in Spanish). Portal Otaku. 2 January 2019. Retrieved 22 January 2019. ↑ Nick Valdez (23 November 2018). "'Dragon Ball Super' to Air One-Hour 'Broly' Special". ComicBook. Archived from the original on 2018-11-24. Retrieved 18 December 2018. 1 2 Egan Loo (7 July 2018). "Funimation to Release Dragon Ball Super: Broly in Theaters in January". Anime News Network. Archived from the original on 2018-10-17. Retrieved 9 November 2018. ↑ Ollie Barder (22 August 2018). "'Dragon Ball Z: Broly - The Legendary Super Saiyan' Comes To Select Theaters This September". Forbes. Archived from the original on 2018-08-23. Retrieved 10 November 2018. ↑ "Nostalgic Dragon Ball Z Titles Come to U.S. Movie Theaters This Fall With 'Dragon Ball Z: Broly - The Legendary Super Saiyan' (1993) and 'Dragon Ball Z Saiyan Double Feature' (1990 & 1995)". PR Newswire. 28 June 2018. Retrieved 10 November 2018. ↑ Kofi Outlaw (12 October 2018). "'Dragon Ball Z' Double-Feature Reveals U.S. Theatrical Trailer". ComicBook. Archived from the original on 2018-10-13. Retrieved 10 November 2018. ↑ Barder, Ollie (2 November 2018). "Goku From 'Dragon Ball' Is Getting A Massive Balloon For Macy's Thanksgiving Day Parade". Forbes. Archived from the original on 2018-11-03. Retrieved 9 November 2018. ↑ Crystalyn Hodgkins (11 November 2018). "Dragon Ball Super: Broly Anime Film Gets Novel". Anime News Network. Retrieved 18 December 2018. ↑ Kofi Outlaw (17 December 2018). "'Dragon Ball Super: Broly' Novel Confirms Major Saiyan Royalty Fact". ComicBook. Archived from the original on 2018-12-17. Retrieved 18 December 2018. ↑ Nick Valdez (17 December 2018). "'Dragon Ball Super: Broly' Novel Reveals Two Awaited Saiyan Names". ComicBook. Archived from the original on 2018-12-18. Retrieved 18 December 2018. ↑ "Top-Selling Light Novels in Japan: January 2019". Anime News Network. 2019-02-14. Retrieved 14 February 2019. ↑ Megan Peters (January 9, 2019). "'Dragon Ball Super: Broly' To Make Historic IMAX Debut". ComicBook. Archived from the original on 2019-01-09. Retrieved 11 January 2019. ↑ Karen Ressler (January 9, 2019). "Dragon Ball Super: Broly Film is 1st Anime to Screen in IMAX in U.S." Anime News Network. Archived from the original on 2019-01-09. Retrieved 11 January 2019. ↑ Megan Peters (19 July 2018). "Watch: 'Dragon Ball Super: Broly' First Trailer Released". ComicBook. Archived from the original on 2018-09-19. Retrieved 9 November 2018. ↑ "Dragon Ball Super: Broly Trailer". ssjpro.com. ↑ Megan Peters (4 October 2018). "Internet Reacts To 'Dragon Ball Super: Broly's New Trailer". ComicBook. Archived from the original on 2018-10-05. Retrieved 9 November 2018. 1 2 Jordan Ramée (19 December 2018). "Dragon Ball Super Broly - Official Dubbed Trailer #3 (2019)". IGN. Archived from the original on 2019-01-06. Retrieved 20 December 2018. ↑ "'Dragon Ball Super: Broly' Gives Longest Look at SSG Vegeta Yet". Anime. Archived from the original on 2018-11-28. Retrieved 2018-11-29. ↑ "New Dragon Ball Super: Broly trailer brings Gogeta into the mix". eventhubs. 29 November 2018. Archived from the original on 2018-11-30. Retrieved 20 December 2018. ↑ "Dragon Ball Super: Broly Trailer 4 - Dubbed". IGN. 4 December 2018. Archived from the original on 2018-12-05. Retrieved 20 December 2018. ↑ Megan Peters (30 September 2018). "'Dragon Ball Super: Broly' Announces Surprise November Premiere". ComicBook. Archived from the original on 2018-12-15. Retrieved 9 November 2018. ↑ David Griffin; Colin Stevens (Jul 12, 2018). "Funimation Is Bringing Dragon Ball Super: Broly to North American Theaters in 2019". IGN. Archived from the original on 2018-07-29. Retrieved 2018-07-12. ↑ Osmond, Andrew. "Dragon Ball Super: Broly Cinema Release Confirmed for January 23 and 24". Anime News Network. Retrieved 9 July 2018. ↑ Madman Entertainment [@Madman] (October 12, 2018). "🔥Prepare for the greatest Super Saiyan showdown! Dragon Ball Super: Broly is in cinemas across Australia and New Zealand January 24, 2019! 🔥" (Tweet). Retrieved December 21, 2018 – via Twitter. ↑ "Dragon Ball Super The Movie: Broly". Madman Entertainment. Archived from the original on 2018-12-06. Retrieved January 18, 2019. ↑ "'Dragon Ball Super: Broly' Opening Weekend Breaks Japanese Box Office Record". ComicBook.com. December 16, 2018. Archived from the original on 2018-12-17. Retrieved 2018-12-17. ↑ Crystalyn Hodgkins (7 December 2018). "Dragon Ball Super: Broly Anime Film Opens at #1 at Japanese Box Office (Updated)". Anime News Network. Archived from the original on 2018-12-17. Retrieved 18 December 2018. ↑ Crystalyn Hodgkins (20 December 2018). "Dragon Ball Super: Broly Anime Film Surpasses 1 Million Tickets Sold in Japan". Anime News Network. Archived from the original on 2018-12-20. Retrieved 20 December 2018. ↑ Crystalyn Hodgkins (25 December 2018). "Dragon Ball Super: Broly Anime Film Earns 2 Billion Yen in 11 Days". Anime News Network. Archived from the original on 2018-12-28. Retrieved 25 December 2018. ↑ "Dragon Ball Super: Broly earns gigantic amount in 11 days, Premieres in US on Jan 16". Devdiscourse. 25 December 2018. Retrieved 25 December 2018. ↑ Jeremy Kay (30 December 2018). "'Aquaman' dominant in fourth global session, nears $750m". Screendaily.com. Screen International. Archived from the original on 2018-12-30. Retrieved 31 December 2018. 1 2 Komatsu, Mikikazu (January 8, 2019). "Japan Box Office: Dragon Ball Super: Broly Earns Massive 3.3 Billion Yen in 24 Days". Crunchyroll. Archived from the original on 2019-01-11. Retrieved January 8, 2019. ↑ "Tweet". Twitter (in Japanese). Dragon Ball Super official account. 14 January 2019. Retrieved 16 January 2019. ↑ "Live-Action Touken Ranbu Film Opens at #5". Anime News Network. 21 January 2019. Archived from the original on 2019-01-22. Retrieved 22 January 2019. ↑ "1st 2 Psycho-Pass SS Anime Film Opens at #7". Anime News Network. 28 January 2019. Archived from the original on 2019-01-29. Retrieved 29 January 2019. ↑ "Japan Box Office: Dragon Ball Super: Broly Becomes Top-Grossing Film in The Franchise". Crunchyroll. 29 January 2019. Archived from the original on 2019-01-29. Retrieved 29 January 2019. ↑ "Dragon Ball Super: Broly Film Earns US$100 Million Worldwide". Anime News Network. 5 February 2019. Retrieved 6 February 2019. ↑ Jeremy Kay (6 January 2019). "'Aquaman' surges past $940m worldwide". Screendaily.com. Screen International. Archived from the original on 2019-01-07. Retrieved 7 January 2019. ↑ Megan Peters (6 January 2019). "'Dragon Ball Super: Broly' Hits Brazil, Becomes Box Office's Biggest Anime Film". ComicBook. Archived from the original on 2019-01-06. Retrieved 7 January 2019. ↑ ""Dragon Ball Super: Broly" se convierte en el segundo mejor estreno en Perú" (in Spanish). El Comercio. 11 January 2019. Archived from the original on 2019-01-11. Retrieved 11 January 2019. ↑ "Dragon Ball Super: Broly bate récord en Bolivia: es la cinta animada con el mejor estreno en la historia" (in Spanish). El Deber. 11 January 2019. Archived from the original on 2019-01-12. Retrieved 12 January 2019. ↑ "Argentina: "Dragon Ball Super: Broly" se impone en la taquilla" (in Spanish). Ultracine S.A. 11 January 2019. Archived from the original on 2019-01-12. Retrieved 12 January 2019. ↑ "Bolivia: "Dragon Ball Super: Broly", gran fin de semana para Goku" (in Spanish). Ultracine S.A. 14 January 2019. Retrieved 15 January 2019. ↑ "Paraguay: "Dragon Ball Super: Broly" debuta en primer lugar" (in Spanish). Ultracine S.A. 11 January 2019. Archived from the original on 2019-01-12. Retrieved 12 January 2019. ↑ "Dragon Ball Super: Broly rompe récords en Puerto Rico" (in Spanish). YOSOYUNGAMER.COM. 13 January 2019. Retrieved 13 January 2019. ↑ "Uruguay: "Dragon Ball Super: Broly" a la cabeza" (in Spanish). Ultracine S.A. 11 January 2019. Archived from the original on 2019-01-12. Retrieved 12 January 2019. 1 2 3 Jeremy Kay (13 January 2019). "'Aquaman' crosses $1bn worldwide". Screendaily.com. Screen International. Archived from the original on 2019-01-15. Retrieved 14 January 2019. ↑ Nick Valdez (14 January 2019). "'Dragon Ball Super: Broly' Global Box Office Dominates in Latin America". Comic Book. Archived from the original on 2019-01-14. Retrieved 14 January 2019. ↑ Nancy Tartaglione (13 January 2019). "'Aquaman' Splashes Past $1B Worldwide; Now #2 DC Movie Ever – International Box Office". Deadline Hollywood. Archived from the original on 2019-01-13. Retrieved 14 January 2019. ↑ Jeremy Kay (20 January 2019). "'Glass' clear box office winner on $89.1m global launch". Screendaily.com. Screen International. Retrieved 24 January 2019. ↑ Anthony D'Alessandro (21 January 2019). "How 'Dragon Ball Super: Broly' Took The Town By Surprise Over MLK Weekend With $22M+". Deadline Hollywood. Archived from the original on 2019-01-22. Retrieved 22 January 2019. ↑ Anthony D'Alessandro (17 January 2019). "'Dragon Ball Super: Broly' Sets Wednesday Aflame With $7M+ Opening". Deadline Hollywood. Archived from the original on 2019-01-17. Retrieved 17 January 2019. ↑ Luster, Joseph (January 17, 2019). "Dragon Ball Super: Broly Hits #1 in U.S. Box Office With $7 Million Day". Crunchyroll. Retrieved January 17, 2019. ↑ Dave Mcnary (17 January 2019). "'Dragon Ball Super: Broly' Scores Big First Day With $7 Million". Variety. Archived from the original on 2019-01-18. Retrieved 17 January 2019. 1 2 D'Alessandro, Anthony (20 January 2018). "'Glass' Now Looking At Third-Best MLK Weekend Opening With $47M+ Despite Cracks In Tracking – Sunday Final". Deadline Hollywood. Archived from the original on 2019-01-18. Retrieved 23 January 2019. ↑ D'Alessandro, Anthony (21 January 2019). "How 'Dragon Ball Super: Broly' Took The Town By Surprise Over MLK Weekend With $22M+". Deadline. Archived from the original on 2019-01-22. Retrieved 21 January 2019. ↑ Anthony D'Alessandro (19 January 2019). "'Glass' Looking At Second-Best MLK Weekend Opening With $50M+". Deadline Hollywood. Archived from the original on 2019-01-18. Retrieved 19 January 2019. ↑ Scott Mendelson (19 January 2019). "Box Office: M. Night Shyamalan's 'Glass' Is Only Half-Full With $16M Friday". Forbes. Retrieved 19 January 2019. ↑ D'Alessandro, Anthony (27 January 2018). "'Glass' Leads Again At Weekend B.O., But Only A Handful Of Oscar Best Picture Noms Will See Boost". Deadline Hollywood. Archived from the original on 2019-01-28. Retrieved 28 January 2019. 1 2 Ramée, Jordan (2019-01-29). "Dragon Ball Super: Broly Breaks Records, Is Now 3rd Highest-Grossing Anime Movie In US". GameSpot. Retrieved 2019-01-30. ↑ "Dragon Ball Super: Broly U.K. and Ireland Box Office". Anime News Network. 28 January 2019. Archived from the original on 2019-01-29. Retrieved 28 January 2019. ↑ "Dragon Ball Super: Broly Beats Your Name at UK Box Office". Anime UK News. 28 January 2019. Archived from the original on 2019-01-29. Retrieved 28 January 2019. ↑ "Clint Eastwood Returns!". numero.co. 28 January 2019. Archived from the original on 2019-01-29. Retrieved 29 January 2019. ↑ "Dragon Ball in on Fire!". numero.co. 28 January 2019. Retrieved 29 January 2019. ↑ "Doragon bôru chô: Burorî" (in Dutch). boxofficenl.net. 28 January 2019. Archived from the original on 2019-01-30. Retrieved 28 January 2019. ↑ Karakoc, Can (5 February 2019). ""Dragon Ball Super: Broly" Weiterhing auf Erfolgskurs" (in German). Anime2You. ↑ Kay, Jeremy (3 February 2019). "'How To Train Your Dragon: The Hidden World' takes flight in $40.2m international session". Screen. Archived from the original on 4 February 2019. Retrieved 6 February 2019. ↑ "Dragon Ball Super: Broly". Rotten Tomatoes. Archived from the original on 2019-01-17. Retrieved 28 January 2019. ↑ "Dragon Ball Super: Broly reviews". Metacritic. Archived from the original on 2019-01-18. Retrieved 23 January 2019. ↑ Mikikazu Komatsu (18 December 2018). "Japan Box Office: Dragon Ball Super Delivers 1.05 Billion Yen Debut". Crunchyroll. Archived from the original on 2018-12-18. Retrieved 18 December 2018. ↑ Megan Peters (18 December 2018). "Review: 'Dragon Ball Super: Broly' Powers Up As The Franchise's Best Movie Yet". Comic Book. Archived from the original on 2018-12-19. Retrieved 20 December 2018. ↑ "Dragon Ball Super: Broly review". Stuff. 28 December 2018. Retrieved 30 December 2018. ↑ Ollie Barder (29 December 2018). "'Dragon Ball Super: Broly' Movie Review: A Legendary Film For A Legendary Super Saiyan". Forbes. Archived from the original on 2018-12-30. Retrieved 30 December 2018. ↑ Allegra Frank (9 January 2019). "Dragon Ball Super: Broly is sublime action anime, even for old fans". Polygon. Archived from the original on 2019-01-09. Retrieved 9 January 2019. ↑ Rafael Antonio Pineda (January 15, 2019). "Dragon Ball Super: Broly, Mirai, More Nominated for 42nd Japan Academy Prize". Anime News Network. Archived from the original on 2019-01-15. Retrieved 15 January 2019. Wikimedia Commons has media related to Dragon Ball.